Image caption Solar Impluse inbound to Kalaeloa Airport after its record-breaking Pacific crossing. Its Solar Impulse vehicle's batteries were damaged on the last leg of the journey from Japan to Hawaii and will take several months to repair. The aircraft will be kept at its Pacific stop-over at Kalaeloa airport while the maintenance is undertaken. Once the work is done there will be some test flights before the global quest resumes in 2016, the team says. That is likely to be in April, and would see Solar Impulse fly from Hawaii to the West Coast of the US. It should then have a sizeable weather window to try to cross America, the Atlantic, and make its way back to Abu Dhabi, UAE, where the circumnavigation began in March this year. The suspension will be a disappointment but the project has already met a number of its key objectives. Pilot Andre Borschberg smashed aviation records when he steered Solar Impulse from Nagoya to Kalaeloa at the beginning of the month. 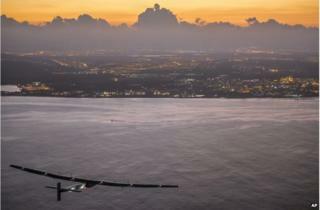 Flying just on the power of the Sun, he completed the 7,200km in 118 hours. Not only did this set several new marks for manned solar aeroplanes, but it surpassed with ease the absolute aviation record for the longest duration solo flight in an un-refuelled vehicle. However, in achieving this mammoth feat, Mr Borschberg's plane experienced damaging overheating in its lithium-ion battery system. Although the battery units performed as expected, they had too much insulation around them, making temperature management very difficult. Engineers on the project have not been able to make the quick repairs that might allow Solar Impulse to have a crack at completing the round-the-world journey this year. The University of Hawaii and the US Department of Transportation have agreed to continue to host the aeroplane in a large hangar at Kalaeloa airport while the maintenance proceeds. Can you survive on 20-minute naps?